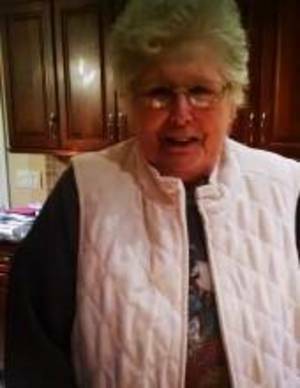 Lois H. McManus (nee Callahan) of Manahawkin, NJ, formerly of Berkeley Heights, NJ, passed away peacefully at her home on Monday, April 8, 2019 at the age of 82. The visitation will be held at Paul Ippolito Berkeley Memorial, 646 Springfield Ave., Berkeley Heights., NJ on Saturday, April 13th, from 11 AM – 3 PM followed by the funeral service to begin at 3 PM in the funeral home. For directions or to send condolences please visitwww.ippolitofuneralhomes.com. Lois was born in Summit, NJ to the late Thomas and Harriet (nee Spinning) Callahan. She had resided in Berkeley Heights, NJ for 39 years before moving to Manahawkin 6 years ago. Lois had been employed as a tour guide for Ciba Geigy in Summit prior to raising her family. She then worked in a secretarial position at Hewlett-Packard in Berkeley Heights before assuming the role of Office Manager at her family’s business, Door Boy, in Berkeley Heights. Lois has also worked as a secretary at Lepton in New Providence before retiring. Lois was a former PTA President, Girl Scout Leader and Cub Scout Leader in Berkeley Heights. She was a member and former president of the Women’s Club of Berkeley Heights as well as a member of the Daughters of the American Revolution. Lois is survived by her beloved husband of 52 years, Robert T. McManus, Sr. of Manahawkin; her loving children, Robert T. McManus, Jr. of Berkeley Heights, Paul McManus and his wife Ellen of Ohio, Mark McManus and his wife Debra of Clinton, and Cheri Perez and her husband Michael of Bridgewater; her cherished grandchildren, J.R., Taylor, Brett, Cooper, Hatcher, Tatum, Parker, Michael, Paige, Kacey, Nicholas, and Kayla. Lois was the loving sister of Mary Jane Cottrel of Summit, David Callahan and his wife Patricia of Australia, and the late Thomas Callahan and his surviving wife Marie of Bedminster. She is also survived by many loving nieces, nephews, relatives and friends. In lieu of flowers please make donation in her memory through her personal memorial donation page at www.inmemof.org/lois-h-mcmanus.